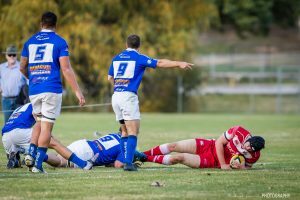 Whilst the story of the day from Saturday is undoubtedly the calamitous first half endured by first grade, the club can be pleased on balance with success in all of the earlier games and consoled by a second half showing in the main game that demonstrated significant character against a confident opponent. Fourth grade started the day on a winning note with an entertaining 54-19 victory. Some early magic from Owen Barker saw Vikings grab an early before Daniel Solofa took over, producing a dominant display against his former team mates highlighted by his hard running and ability to position his support runners. Jack Howard also demonstrated his class at fly half, showcasing all the skills in general play and kicking accurately for goal. Whilst the coaching staff were deservedly pleased with the victory they face a huge selection dilemma this week with star open side flanker Montgomery facing a harsh punishment for his attempted clearing kick late in the game. A defence of “I’ve never kicked in a game before and wanted to try it out” is not expected to hold water. Third grade were also excellent in taking out an occasionally spiteful encounter 33-19, with the result in the balance until a brilliantly instinctive Owen Barker intercept on full time. John Gibson’s hot streak with the boot continued, with a chip setting up the opening score for his side and an 80 per cent success rate off the tee giving the side breathing room on the scoreboard. Damien Gubler was outstanding up front, scoring 2 tries and involving himself heavily in attack and defence. Richard Joyes also revelled in the physical encounter, with his dominant carrying and no-nonsense attitude at the breakdown big factors in the final result. Colts were pushed all the way by an improving bluebags outfit, ultimately kicking away to win 40-12 in a game where the scoreline didn’t reflect the tightness of the contest. Hano ‘Sergeant’ Shultz was a standout in the pack, carrying aggressively and revelling in any opportunity to run into a blue jumper. Instagram identity Jerry Borle was also a handful for the red men, with a spectacular solo try immediately after half time a reminder of his unique talents. Whilst coach Allardyce will lament his side’s tendency to drift in and out of games mentally, he will be happy with the way they found points when they needed them. Second grade provided fans with another heart stopper, with the game anyone’s before a solo special from Sam Giltrap confirmed a 30-19 result for the good guys. Whilst Phil Kite’s cameo appearance en route to New Zealand was more about securing this year’s kit for his impressive collection than any sense of club loyalty*, his presence was appreciated up front in a tough battle. Callum Smith and the retuning Darcy Swain were superb in a pack who all played their part in providing clean ball for their rookie halves duo, while captain Josh Hitchens was also tireless. The two Jacks (Evenden and Mann) certainly didn’t look overawed by the occasion, and provided good ball for their outside men to attack with. The coaches will also be thankful to Joe Langtry, whose cover defence late in the game prevented an even tighter finish. Firsts were shell-shocked by a sensational first half display from Royals, who made a real statement in jumping out to a 39-7 half time lead. Whilst the Vikings toiled hard, they were unable to break the stingy Royals defence until midway through the half when a scything break from Jake Knight off a well worked set play finally got them on the scoreboard. Unfortunately Royals, as they did all day, punished an error soon afterwards and went into half time well in the ascendancy. Coach Sampson will be impressed with the resolve shown by his side in the second half, as Vikings dominated territory and possession but unfortunately failed to make inroads on the scoreboard as the match finished 46-14. Joey Vejvoda was immense up front in a beaten side, whilst Fred Dorrough showed some promising signs in his run on debut. Firsts will look to get back on track this week against Wests in what should be an absorbing follow up to a physical pre-season clash. All men’s grades are at home, with the Viqueens facing Uni-Norths at Griffith Oval. This weekend the club welcomes it’s valued supporters for sponsors day.